Our world is sending us warning signals that we are disturbing its equilibrium. A drastic cut in our environmental impact is called for. This Probe explores how the solution is likely to come from biological processes, which are less energy-consuming and non-polluting. 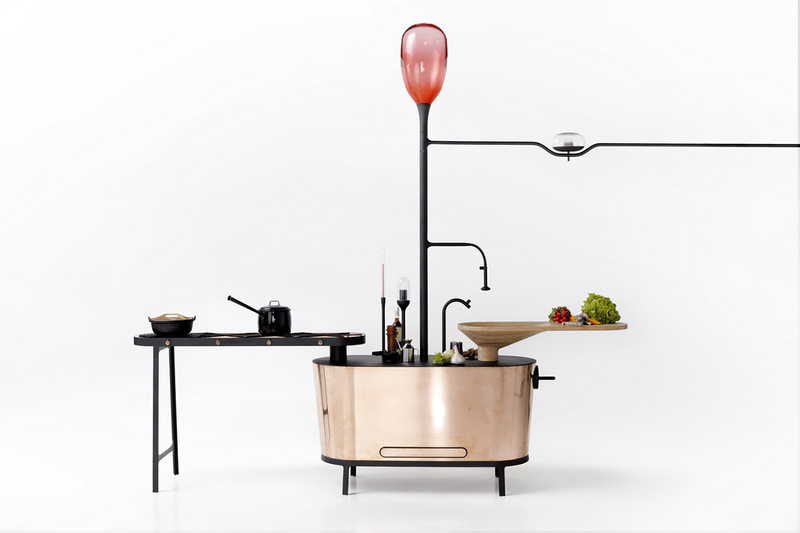 The bio-digester hub is designed as a repositionable kitchen island, including a chopping surface with vegetable waste grinder, a gas cooking range, a glass tank that shows energy reserves and glass elements showing pressure, volume and readiness of compost sludge. ‘Bio-gas’ is produced by developing a culture of suitable bacteria living on organic waste material from the home. The gas the bacteria generate is fed to a cooking range and gas mantle lights. Water pipes are preheated by the digester and channeled to other components in the Microbial Home system. 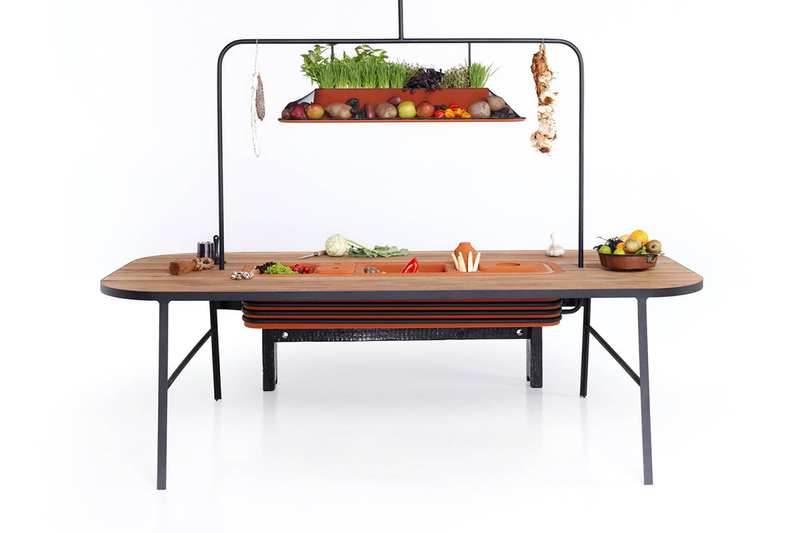 The larder revives the ritual of preparing food together around the dining table. With a twin-walled terra cotta evaporative cooler at its center, the compartments and chambers vary in wall thicknesses and volumes, and are designed to keep different types of food at different optimal temperatures. The outer surface of the cooler is warmed by hot water pipes, which have been pre-heated by the methane digester in the Microbial Home system. Above the table is a ceramic garden and larder where vegetable groups are grown and stored on the basis of their symbiotic chemistry. The design of the beehive consists of two parts: entry passage and flower pot outside, and glass vessel containing an array of honeycomb frames, inside. The glass shell filters light to let through the orange wavelength which bees use for sight. The frames are provided with a honeycomb texture for bees to build their wax cells on. As global bee colonies are in decline, this design contributes to the preservation of the species and encourages the return of the urban bee. Increasingly, people want to reclaim control over their own health. This does not mean abandoning specialists, rather it implies a better collaboration in monitoring, diagnosis and treatment. We know that there is more to health than treatment for ‘illness’, and an ongoing quest for the maintenance of ‘wellness’. The apothecary places health at the center of the home. It has monitoring, diagnostic and remedial components, but its main focus is on early warning and prevention of disease. Analytical functions are designed into the bathroom, where cutting-edge technology analyzes your body constantly and non-invasively, looking for trends in your health, symptoms of wellness and disease, giving advice and warnings where necessary. The concept of the filtering squatting toilet incorporates a handrail to support a person in the squatting position. The filter array, comprised of charcoal, sand and ceramic filters, supports a range of plants to clean effluent. The concept is sustainable and ecological. It uses no energy, is water saving and non-polluting. The system is designed to show the energy value in human waste and raise awareness about wasting water. It provokes discussion and evaluation of toilet taboos and ablution habits. It draws attention to the necessary systemic shift from utility dependent sanitation systems to regenerative localized solutions that see waste as a necessary part of a domestic eco-system. 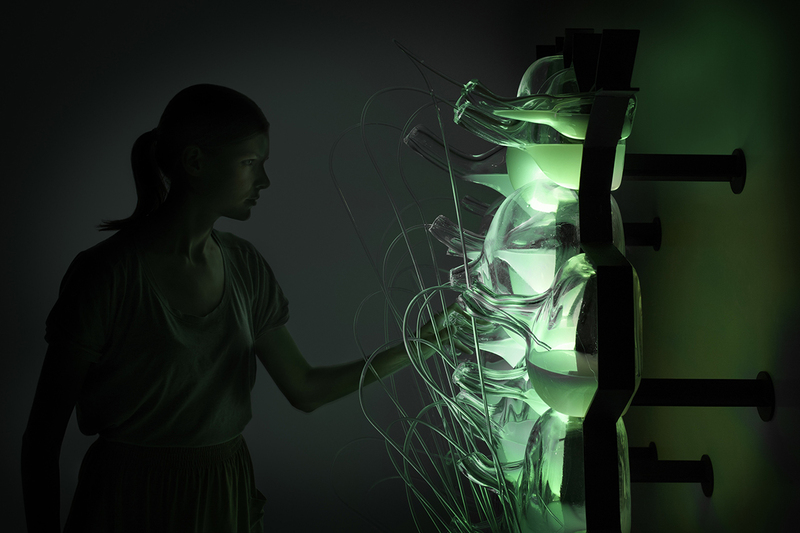 The bio-light design concept is a wall of glass cells containing a live bacterial culture that emits soft green light by bioluminescence. It has been created using a technique where individual cells are hand-blown into a steel frame which is freestanding or hung on the wall. Each cell is connected via silicon tubes to the food source, (which is drawn from a reservoir at the base) creating a closed loop system for the living material. This represents a new genre of ‘living’ biological products. 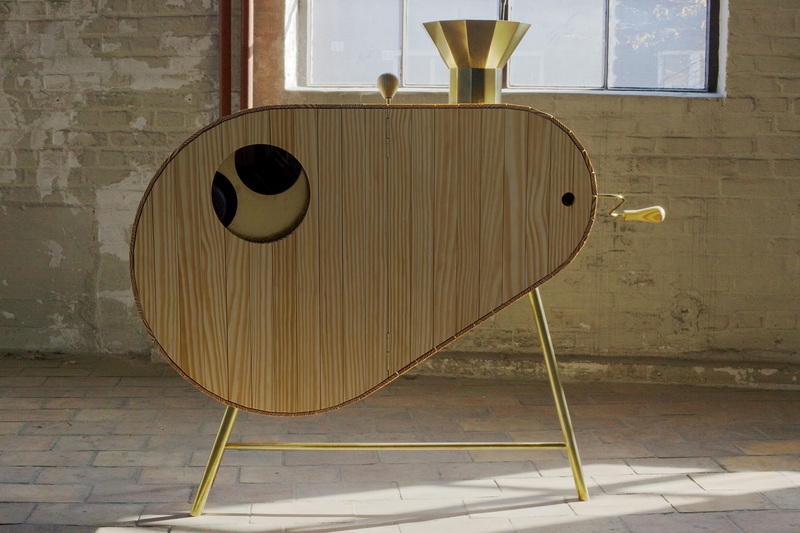 The paternoster waste up-cycler concept utilizes the properties of fungi that have powerful enzymes and decomposing power. A mycelium attached to plastic, would have the ability to decompose and metabolize the plastic. Provided the inks on the plastic did not contain toxic heavy metals, this mycelium could in theory generate edible mushrooms. In this concept the plastics are ground into small chips and mixed with a fungal starter culture in a glass canister, which is slotted into a compartment of the ‘paternoster’ system. A hand-cranked conveyor moves the canisters along a circuit within a dark cavity. Each week plastic grounds are mixed with mycelium. It takes several weeks to break down the plastic or other waste material. While the electro-mechanical age may have caused the problem, it could also help us find the solution. Technological development has enabled us to mimic nature’s processes. Now all that is lacking is a collective change in consciousness to take us into a Biological Age, one where materials can repair themselves and where by-products are no longer waste but fuel for other systems. 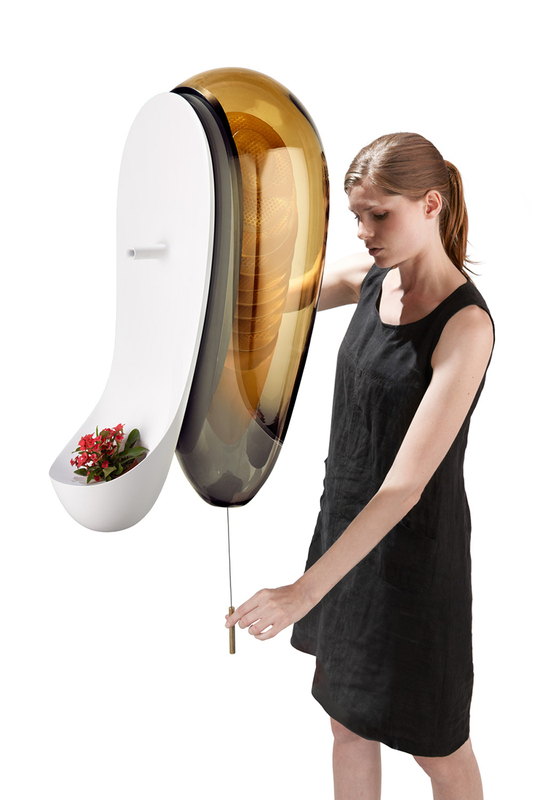 Microbial Home is a Probe, a far-future design concept. It is not intended as a production prototype nor will it be sold as a Philips product. Like past Probe design concepts that have stimulated discussion around a range of issues, this concept is testing a possible future – not prescribing one.